Ultra-catchy, sugar-sweet power-pop with blossoming melodies that grow and grow to a bright, beautifully appealing sound, boosted by the band's ability to play things steady and fast, keeping true to form and playing everything with power but never forgetting the pop that drives the songs. 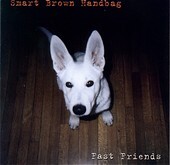 Smart Brown Handbag's Fast Friends is a slick, but not overly produced, collection of toe-tappin', bouncy, and most importantly easy-to-sing-along-with nuggets that make you want to smile and have a good time while you indulge in air guitars, singing along, and moving to the easy, infectious beats. Fast Forward reminds us of the power of pop, the beauty it can represent, and the fun you can have listening to it. It is proof that music doesn't have to be empty to make you want to smile and have a blast; it can have substance and feeling as well. I'll give it an A.